Be the first to share your favorite memory, photo or story of Ames. This memorial page is dedicated for family, friends and future generations to celebrate the life of their loved one. Mr. Ames Bowman, Jr., 72 of Mt. Vernon, died Friday, November 16, 2018 at the Compassionate Care Center in Richmond. He was born in Rockcastle County, KY on April 8, 1946 the son of Ames, Sr. and Myrtle Clark Bowman. 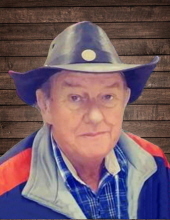 He was a carpenter, an avid fisherman and hunter, and was a member of Brush Creek Holiness Church. He is survived by his loving wife of 40 years, Charlotte Begley Bowman; two sons, Amos M. Bowman and wife Rebecca of London and Daniel R. Bowman and wife Michelle of Mt. Vernon; two daughters, Carla McCoy and husband Travis of Mt. Vernon and Tammy Higginbotham and husband Benny of Berea; five brothers, Delbert and Alene Bowman of Bronston, Clentin and Reda Bowman of Orlando, Bobby Dale and Mary Bowman of Somerset, Glen and Marsha Bowman of Mt. Vernon, and Cecil and Norma Bowman of London; and five sisters, Ada McGuire and Katherine and Donald Robinson, both of Orlando, Ollie Cain of Somerset, Jeweldean Durham of Mt. Vernon, and Eva Wynn of London. Also surviving are eleven grandchildren, Michael McCoy, Hailey McCoy, Amos John Bowman, Zoey J. Bowman, Sadie J. Bowman, Jennifer and Shawn Cain, Jason Sweeny, Jordan Sweeny, Joseph Debord, Rebekah Debord, and Denise and Sam Smith; and seven great grandchildren, Jeremiah Cain, Zachary Cain, Lukas Cain, Jayson Bradley, Foxx Bloomer, Landon Lawrence, and Samuel Smith. In addition to his parents, Ames and Myrtle Bowman, he was preceded in death by a son, Amos Broderick Bowman; two daughters, Vanessa Harrison and Carmelia Faith Bowman; and a sister, Nannie Davenport. To plant a tree in memory of Ames Bowman, please visit our Tribute Store. 75 Brush Creek Church Rd. "Email Address" would like to share the life celebration of Ames Bowman. Click on the "link" to go to share a favorite memory or leave a condolence message for the family.